That’s Cedomir Kostovic, a professor in the department of art and design. He came to the U.S. in 1990 from Bosnia and Herzegovina and has been teaching graphic design at Missouri State University for 25 years. Design, Kostovic said, is about using visual communication to solicit a desired human behavior. From public service posters and commercial advertisements to road signs, designers must think beyond artistic expression to understand how color, typography, imagery and other content can be leveraged to create a design solution. They must also use this power responsibly and for the good of society, he said, a mentality he adopted from his college professor and mentor, Mladen Kolobaric, at the Academy of Fine Arts Sarajevo. Kostovic now inspires his own students to do the same, both in the classroom and out. An award-winning designer, Kostovic’s socially impactful posters are known throughout the world. His recent sabbatical project, an international poster exhibition, reached thousands of people across five countries. He organized the exhibit with other former Kolobaric students: Amra Zulfikarpasic, Dalida Karic-Hadziahmetovic and Mila Melank. In 2014, the quartet challenged hundreds of designers around the world, including 30 Missouri State students, to commemorate the last 100 years of history for Kostovic’s native city, Sarajevo, a place where cultures converge and, sometimes, clash. It has seen years of war, starting with the assassination of Archduke Franz Ferdinand in 1914 that sparked World War I, and more recently the siege and ethnic genocide during the Bosnian Conflict. The embattled city has also striven for peace and unity, punctuated by its hosting of the 1984 Winter Olympics, the first winter games to be held in a Communist state. “Sarajevo 100” debuted in June 17, 2014, at the City Gallery Collegium Artisticum in Sarajevo, showcasing the work of 268 designers from 37 countries and five continents. The project was supported by the U.S. Embassy in Sarajevo. The posters offered a diverse, multicultural perspective about a place many of the participants had never heard of before. MSU alumnus Tyler Galloway, now an associate professor of design at the University of Kansas, participated in the exhibition. His poster paid tribute to his teacher, Kostovic, and his teacher’s teacher, Kolobaric. The exhibit traveled to France, Russia, Mexico, Poland and Missouri State University’s Springfield campus, bringing global attention to the region, its history and its growing recognition as a symbol of peace. Kostovic said the posters will likely be studied by designers for decades to come; and his own poster will be among them. 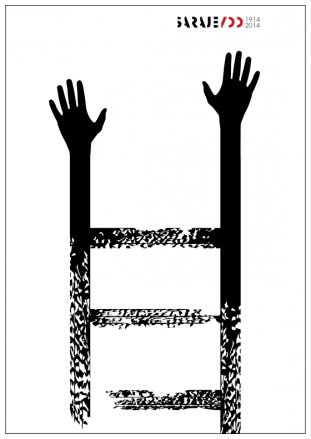 On it, a black, partially burned ladder appears against a stark white background, its three rungs leading to two hands reaching upwards. The three steps symbolize the three historic events — Ferdinand’s assassination, the 1984 Winter Olympics and the 1990s Bosnian Conflict — as well as the area’s three ethnic groups — Serbs, Croats and Muslims — who, despite years of conflict, still have hope for peace. I see beauty everywhere. I also believe in the creation of beauty; therefore, I specialized in writing as a way to interpret and to express unique life experiences. I have always had an aptitude for mathematics-I like it, it makes sense, I like finding the answer!